High-end Pidgin restaurant (on the right) sits directly opposite notorious Pigeon Park (on the left). A new, upscale restaurant in the heart of Vancouver's impoverished Downtown Eastside has been drawing protesters who see it as another blatant step in the gentrification of the neighbourhood. Pidgin, on Carrall Street just off West Hastings, opened Feb. 1 in what was once a pawnshop, though the space had been vacant since the 1980s. It's not the first trendy eatery to set up in the district but its presence is seen by some residents as a slap in the face because of its location. The restaurant looks out onto Pigeon Park, which is less a park and more a knot of trees encased in concrete with a few benches. It's a local social hub of sorts but also a notorious hangout for drug users and dealers. Pidgin co-owner Brandon Grossutti told the Vancouver Province protesters have been picketing almost daily, have vandalized the building and harassed customers by heckling, taking their pictures with camera-phones and shining flashlights in their eyes as they dine. "It's been really aggressive," he said, adding they've told him the goal is to shut the place down. The demonstrations have been organized by the Carnegie Community Action Project, a social advocacy group long opposed to the gentrification of the Downtown Eastside, which it wants preserved as a low-income community. The neighbourhood of almost 20,000 people includes touristy Gastown to the west, Chinatown and Strathcona, with its heritage homes. But it's the few square blocks bounding Hastings Street that mostly account for the Downtown Eastside's infamous reputation. Dotted with fleabag single-room occupancy (SRO) hotels where its most desperate residents live, it became nationally known as the hunting ground of serial killer Robert Pickton. Its back alleys are littered with wrappers from hypodermic syringes and drug dealing happens within sight of the Main Street police station near the old Carnegie Library, now a community centre. Billions of dollars have been poured into the neighbourhood and both government and non-government social agencies are busy trying to improve its residents' lives with little noticeable change. The Downtown Eastside has been gentrifying for more than a decade as rising property values have forced businesses and developers to look for cheaper space. But the trend has only recently pushed into the heart of the neighbourhood, alarming its advocates who see it as part of a deliberate plan to push out the poor. "The processes of neo-liberal urbanism that fuel this kind of gentrification are rooted in the colonial doctrines of discovery and terra nullius, as well as more modernized forms of transnational globalization," said an article about the trend posted on rabble.ca last year. Such undergrad theorizing aside, gentrification poses a real dilemma. For all its faults, there's a cohesiveness to the community that its defenders clearly see being threatened when redevelopment makes it unaffordable to live there. While newcomers like Grossutti promise to contribute to the area with jobs and charitable works, opponents like the Carnegie project's Ivan Drury see no benefit from their presence. 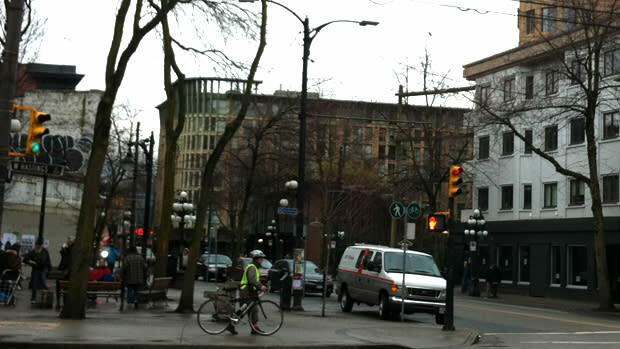 But the city views the encroachment of trendy businesses into the Downtown Eastside as a good thing. Jang noted the city and the B.C. government are working to develop vacant lots and convert buildings such as the demolished Pantages Theatre into affordable housing, and to buy up decrepit flophouses and make them liveable at low rents. “For me, it’s not so much a case of gentrification but ensuring that our policies don’t ghettoize,” Jang said. But for poorer residents, the upscale trend means unaffordable condos, $3 doughnuts and expensive coffee, fewer places to gather and socialize or where they even feel welcome. "Some residents, especially of the SROs, don’t have a lot of community space, so the urban environment itself becomes an important space to have socially," Wes Regan, executive director of the Hastings Crossing Business Improvement Association, told the Sun. "Pigeon Park is a great example ... So that needs to be respected in my opinion." Not everyone agrees. James Oickle, who lives near Pidgin, said he was appalled to see protesters harassing people going in for dinner on Valentine's Day. “I’m really surprised they are picketing here,” he told the Province. “I’d say 90 per cent of the people who live down here can’t figure out why these idiots down here are protesting.